We initially wrote this post for Got Ireland in Feburary 2013. 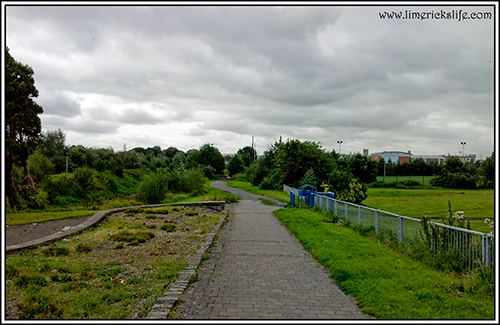 It is not immediately evident to Limerick’s visitors that the city possesses quite a few walkways where it is possible to find a peaceful sanctuary within the confines of bustling city life. Below we will describe how to locate these hidden treasures, and how each one has its own unique style. Each of these walks can be completed in half an hour or can be expanded to take a few hours. As you are leaving the city from the direction of the Dublin Road, just after the turn off to the Abbey Bridge, the pathway expands and you are confronted by a large green painted iron gate. While the gate may seem big and ominous, do not be put off by this gate! It is there to mark the entrance to the Canal walk. The canal was built in the mid 18th century, and up until the 1960s it was a centre of hustle and bustle as barges transported their goods to and from Limerick. Now, while the canal remains, the hordes of activity are no longer created by humans, but by a myriad of wild life that have made this area their home. When you take the time to find this hidden walk along the canal, it is not uncommon to witness herons, swans, ducks as well as many smaller native birds living and playing in the brush along the trail. One of the great things about this walk is that it branches into many others, which can really appeal to the adventurous types. At the end of the main canal walk, you have three additional options to go from there. First, you can cross over the bridge and return to the city along the opposite bank of the canal. Second, you can continue straight on and re-enter another walk way which will bring you along the river bank all the way to the University of Limerick and beyond. 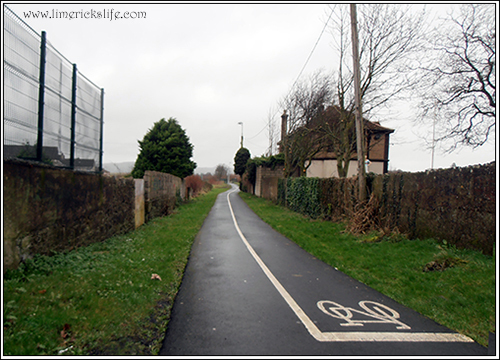 And third, you can cross over the bridge and re-enter yet another walkway which brings you out to Corbally. The latter two options will lead you through trails that make you completely forget that only a few hundred metres away is city life; as you will be surrounded by towering trees, large bodies of water and the calming sights and sounds of wild life. This treasure is hidden right in the heart of the city. You could easily pass it by and never know it is there. Hidden to the left of a 70s concrete office block is a small gate. This gate looks as if it is private property, but it’s not, so be sure that once you locate it, enjoy it at your leisure. Once through the gate you will be led to the back of the Hunt Museum, which was once the city’s Custom House. From here you will continue over the Sylvester O’Halloran footbridge, named after the Limerick man who developed the modern cataract operation, and led many people to be able to enjoy views just like what this walk will provide. Going over the bridge brings you to the Potato Market car park, from where you should take a left around the back of the Court House, behind City Hall and finally you will find yourself in a large open space covered in beautiful and vibrant green grass. 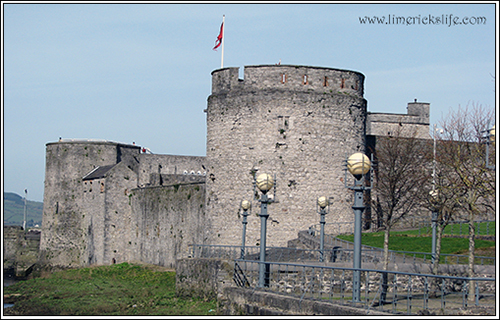 This open space gives you the most impressive view of the magnificent Shannon River and the magnitude of King John’s Castle. You finish this walk by exiting by the Castle. Turning right here leads you through the English Town quarter and back into the city, turning left will bring you over Thomond Bridge and towards the Clancy Strand walk (detailed below), and going straight ahead leads you on to the King’s Island Walk (detailed below). 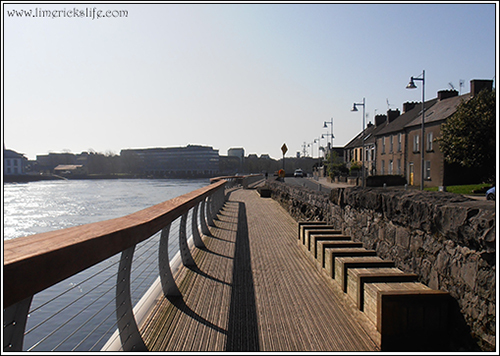 From Thomond Bridge, turning left will lead you directly to the Treaty Stone, which begins the Clancy Strand and O’Callaghan Strand city walk, whose area has recently been renovated. One of the new additions includes many informative plaques have been placed along the walk which aim to educate you on the city and her history while you take in a fantastic view of the city skyline from the opposite bank of the river. Keep your eyes peeled on this walk as you pass the house for which these strands are named. These quaint redbrick houses are riddled with bullet holes to this day from the assassination of the Mayor George Clancy and former Mayor Michael O’Callaghan of Limerick in 1921. There are many spots to stop, sit and take in the view along the walk, which takes you past Sarsfield Bridge to the St. Michael’s Rowing Club. On the slip way at the end of O’Callaghan Strand you will most likely see a bevy of gorgeous white swans. It is advisable to not go down to the swans, as while they will take the food visitors throw their way, they are not very fond of the visitors themselves. Just like the other walks you now have two options; first, you can climb the steps and cross back into the city over the Shannon Bridge, or you can continue under the bridge to the Westfields Wetlands Bird Sanctuary. You will find King’s Island most easily from the Castle walk (detailed above), straight past the Bard of Thomond and crossing over the road to Bishop’s Palace, past St Munchin’s Church and Villier’s Almshouses. It won’t be long before you reach this pedestrian walk that takes you along the river around the old King’s Island. This is the most underused walkway in the city, whose main visitors are school children talking a short cut from one side of the city to the other. On this walk you will see where the Abbey River diverges off the Shannon River forming this Island. Folklore tells us that the Abbey River was created by Viking invaders whose ships could not cross the Curraghgower falls on the Shannon River. You exit this walk at O’Dwyer Bridge where you take a right back into the city along Athlunkard Street, a street with a Norse name harking back to the Viking folklore of the area.